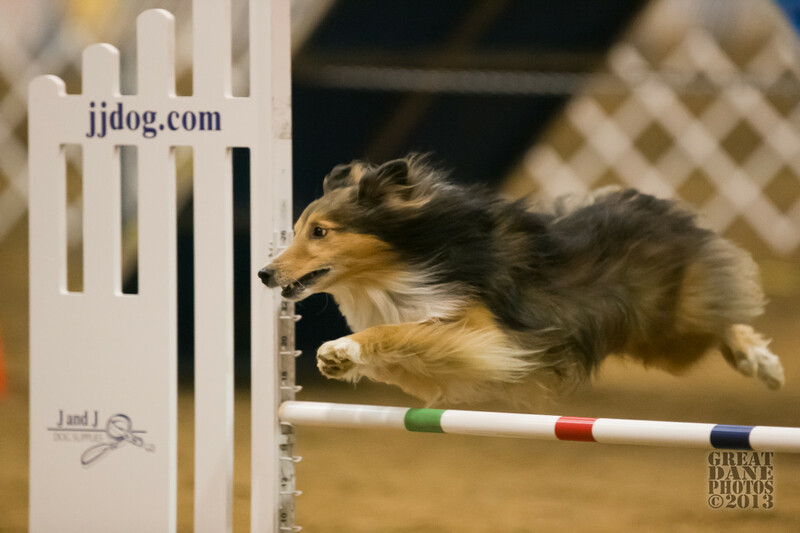 How to Train the "Out" Directional in Agility - Part Two in "The Distance Series"
There is no doubt the physically limited handler has more than agility obstacles to overcome when training a dog. Handling when your body doesn't perform as you would like can be so emotionally and physically difficult that many handlers give up the sport they love. But they don't have to. By training your dog and yourself to learn how to run at distance and with strict directional cues, you can free your dog to run the course while you walk, trot, or even handle from a wheelchair. Distance and directional cues are key for any handler with physical limitations. Directional cues are simply those the handler gives the dog to tell him which direction to go next. The dog then takes the obstacle he finds in that direction. 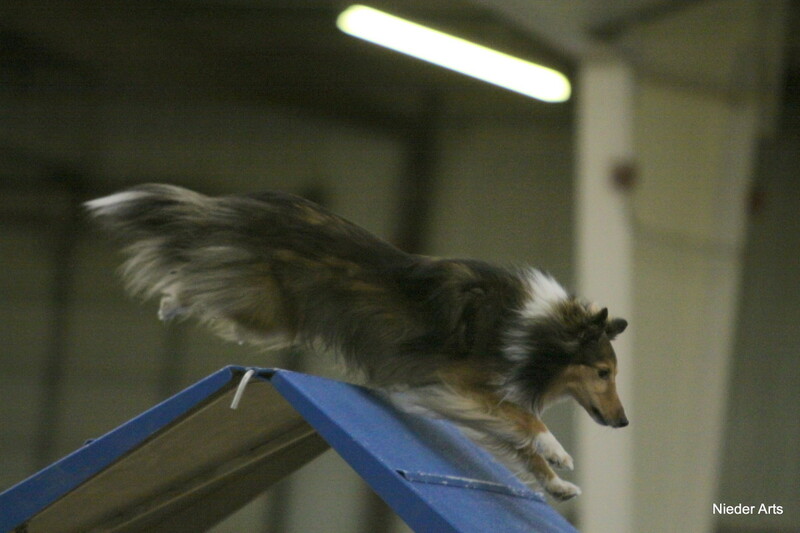 In my article "How to Train an Agility Dog to Run with a Physically Limited Handler" found here (I strongly recommend reading it before reading this article), I discussed the four most basic directional cues I use to get my Shelties around a course. These cues are Out, Here, Straight, and a side switch cue. There are other more advanced directional cues including a back side, threadle, 270, left and right wrap and more but for this article, we will focus on the four basic directional cues. In the this article and the next one, I will explain how I train each of these directional cues and how I train the dog to perform them at distance. First, let's look at the Out cue. Out simply means ""work away from me at a parallel distance." Out does not mean "go straight." 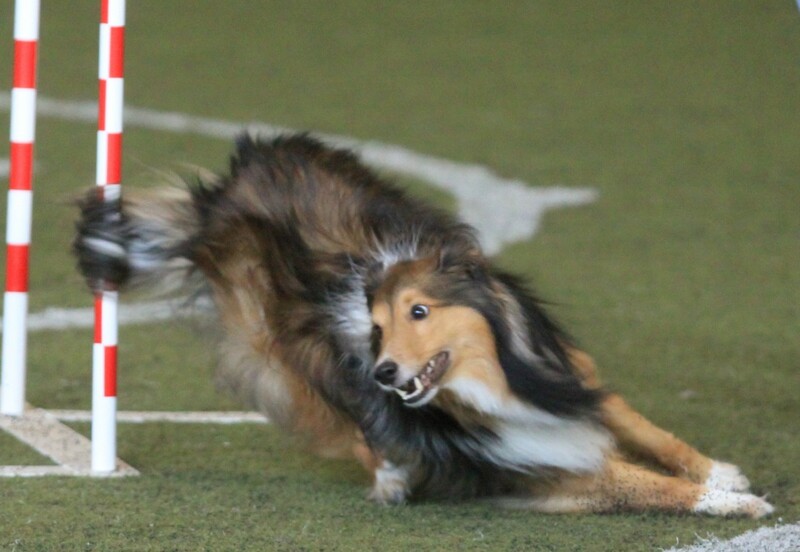 There is usually a turn to the dog's line when performing the Out. This is the ultimate distance directional cue. 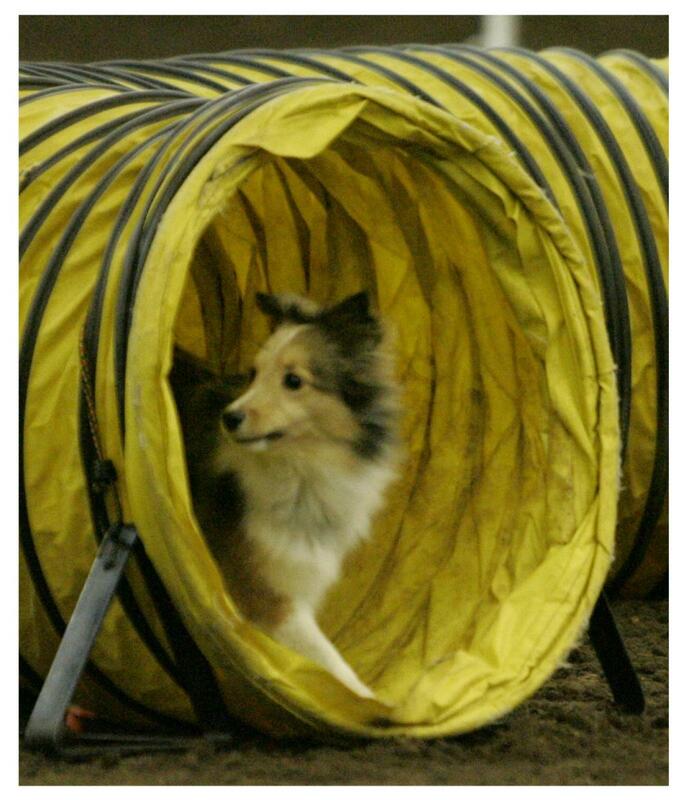 It sends your dog out and away from you to perform an obstacles independently as you move to get into position to handle more difficult, tighter sequences within the course I use Out several times in each course I run. It's indispensable and is an absolute must for any handler who cannot run well. When the dog is ready for Out training, I set up three jumps spaced about 15' to 20' apart. The first and third jumps are in a straight line, but the second jump is pushed slightly off the line as seen in Figure 1. I can use any or all of three techniques to train Out; pattern training, plate training, or toy training. Which technique(s) you choose will depend on your dog. Let's look at how these three techniques can be used, incorporating the three jump sequence. Pattern training is the option I use most. This does require you to have the ability to move a bit. Pattern training is simply moving with the dog through the three-jump sequence until he understands the presented pattern. You can do a lead-out to limit the amount of distance you have to run. Then send your dog over jump #1, run at an angle toward jump #2, and then run to jump 3 as seen in Figure 1. Initially do this in one direction only. Later, you will reverse the direction and have your dog on your other side. After repeating the sequence with your dog several times (and it's apparent he understands it), you then begin to work the Out command. Repeat the sequence again, but instead of running all the way up to jump #2, run about 3' - 5' from that jump. 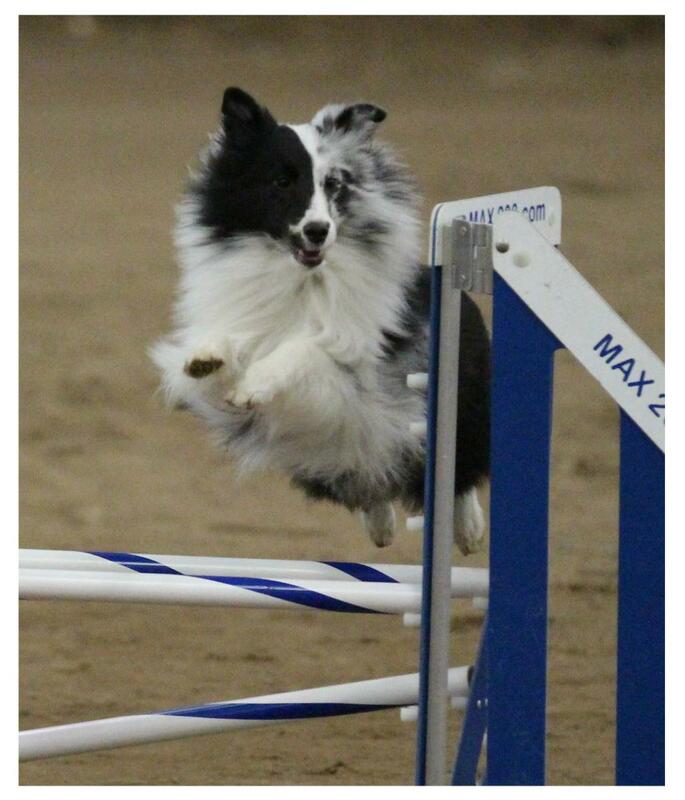 As your dog commits to jump #1, give the Out command and, if you'd like, your jump command for #2. Always give the directional command before the obstacle command because a dog has to know where to go before what to take. For the first few times through the sequence when you're working Out, you reward after jump #2 if the dog successfully goes out. After the dog has the idea that you want him to take jump #2 when you are 3' - 5' away, you then call the dog with a Here cue for jump #3. Make sure your verbal Here is timely. It should be given as your dog commits to jump #2. Soon the dog will know the pattern at a 3' - 5' distance. With the increased distance, run the pattern again, rewarding the first few times for successful distance at jump #2, then adding in a Here recall as you move to jump #3. If your dog is unsuccessful, examine your body movement and position to make sure all four signs the dog needs from you are being given. As more distance is added, handlers often feel it necessary to stand still when the handler's running path becomes shorter. Stopping all forward motion will more than likely pull your dog off the jump and into you. Some forward motion needs to remain to keep your dog moving out away from you. You may need to mover slower or take smaller steps to keep forward motion in play, but do not stop completely. Remember, stopping forward motion or decelerating IS a turning cue. You can eventually train your dog to move forward at distance to take obstacles while you stand still, but this can take quite a bit of training. Depending on your limitations, you my or may not want to train to this level. As you increase distance between you and jump #2 if your dog becomes confused, you may have to move in closer again to jump #2 to help your dog back into his comfort zone before stretching the envelope by moving farther away from jump #2. 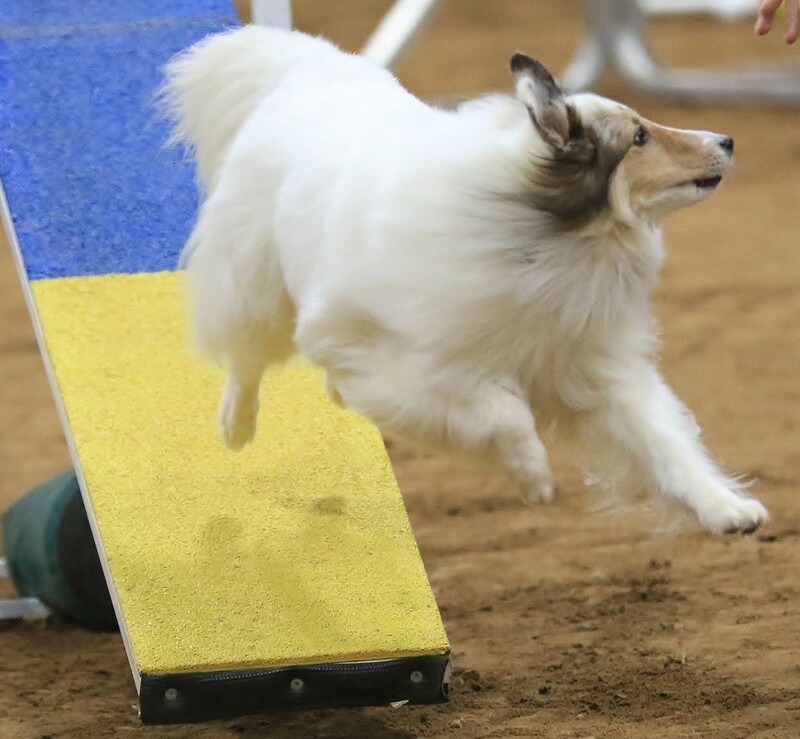 When you are able to run a straight line from jump #1 to jump #3, sending your dog out to jump #2, push jump #2 a few feet farther away from jumps #1 and #3. (See Figure 5) You can also spread out the distance between all there jumps as the lateral distance to jump #2 increases. Once your dog is doing well working on one side of you, do the same sequence with the dog on the other side. Pattern training is a great learning tool for many dogs, but for dogs with a low tolerance for repetition, it may not be the best option. It does require some movement on the part of the handler, causing a potential problem for some. Depending on my dog, I may opt to use a bait plate (or an already trained nose touch to a plate) as one method for teaching directional cues. Remember, you can use one, two or all three of these methods with your dog. To use this method, set the jumps in the sequence shown in Figure 1. Place the plate 5' or more past jump #2 in a direct angled line from jump 1 to the plate as seen in Figure 6. The dog should run this line to go out to the plate. The first few times you run the sequence, run the angled line with the dog directly to the bait plate so the dog learns there is a treat on the plate. After the dog is moving happily and quickly to the bait plate, begin to slowly fade your motion from jump #2 until you are running in a straight line from #1 to #3. This is done exactly the same way you increased distance with pattern training. 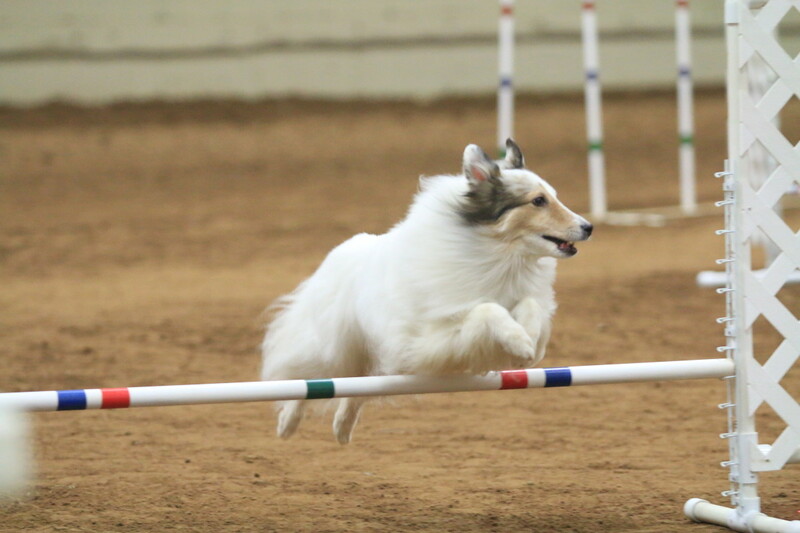 As you increase you handling distance from jump #2, your dog should continue to run toward the baited plated to get rewarded for working away from you. When the dog is running happily to the bait plate with you about 10' away, you can let him run to the bait plate, get his reward, and then call him over jump #3 with the Here cue. As your dog shows success, you can increase your distance from jump #2 until you are running a straight line between jumps #1 and #3. Make sure your shoulders, hand signal and verbal cue are all still in play and being used correctly as you remove your forward motion by moving laterally. When you are running a straight line between jumps #1 and #3, you can push jump #2 farther out. Any change in the distance or angle between jumps may confuse the dog, so be prepared to go back to step one (running to the bait plate with the dog) to get the dog to be successful. When the dog is successful with a distance you are happy with, fade the bait plate. Be sure to run the jumps in reveres order to work Out the other way. The third method I use to teach distance with directional cues is toy training. This is a fantastic tool for the toy-motivated dog. This method works very much like the plate training method, except you use a toy. You can do one of two things with the toy: You can set it in a direct angle between jumps #1 and #2, just like a bait plate, or you can throw the toy over jump #2 to get the dog to take the jump. The advantage to throwing is the exciting added motion of the toy, which can also increase the dog's drive. The challenge, however, is that your aim needs to be very, very good. You must throw the toy over jump #2 and have it land in about the same spot where you would set the bait plate. (See Figure 7) A ball or other toy that rolls will likely move beyond this range and take the dog out of position for turning back to jump #3 when you reach that step. Toys that do not roll are the best choice for this training. Whether you throw the toy or place the toy, you use the same steps used with the plate training method to teach your dog the Out cue. When the dog is successful with this jump configuration, use other sequences with jumps to work your Out cue, again using pattern training, plate training or toy training (or any combination of the three) in the same way. Sequences I find helpful for Out training include pinwheels with the second jump serving as the Out jump (see Figure 8), jump arcs with any number of jumps involved where the handler sends the dog out to run the arc of jumps while running an almost straight line between the first and last jumps. (See Figure 9), and sequences from actual courses where and Out cue could have been helpful. After the dog is proficient at going out for jumps, begin working with other obstacles. Remember to keep your criteria for all obstacles consistent as you work distance. If you desire a two-one/two-off contact on the A-frame, make sure that criterion is strictly met, even though you might be handling from 20' - 50' feet away with an Out cue. Handlers tend to loosen their criteria when working distance, and this often creates confusion for the dog and eventually may lead to other problems. A strict adherence to details like contact criteria can make or break your training. This is especially true for handlers with physical limitations who aren't able to be close to give strong physical cues to a dog to hit a contact or perform a table correctly, for example. Physically limited handlers my not be the most talented athletes on the course, but they can be the best trainers. Great trainers stick to their behavior criteria both in training and in the ring. For puppies and dogs not yet jumping, you can also play the "Bucket Game," a wonderful way to introduce the Out cue. Nancy Gyes had an article on this fun game in "Clean Run" magazine in June of 2007. Handlers with physical limitations should consider their physical abilities and their dog's skills when choosing which training method to use. Pattern training requires more handler movement and may not be the best option for those handlers with mobility issues. Plate training allows a handler to move less, but does require the dog have previous training to the plate. 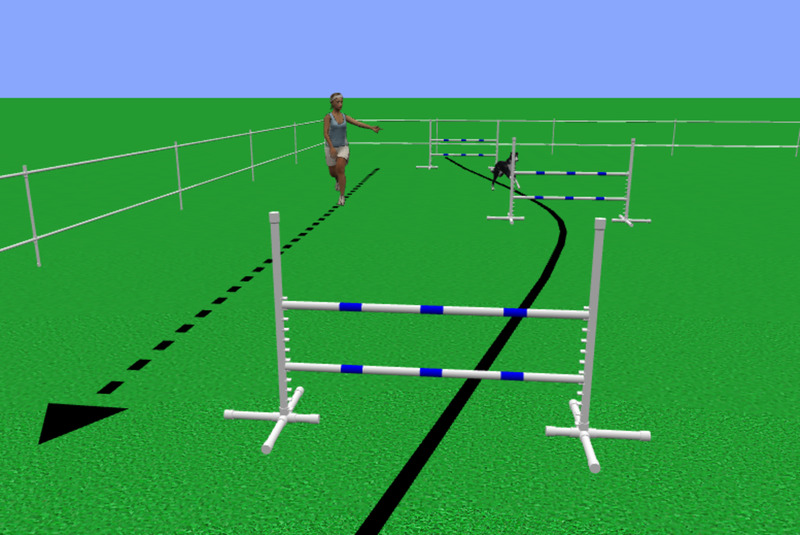 Plate training may also require a second person to stand by the plate to cover up the reward if the dog goes around obstacles instead of taking obstacles to get to the plate. Toy training is also a great tool for handlers with mobility problems, but the dog must be toy motivated. In the next article, I'll explain my training ideas for the other three directional cues, Straight or Go, Here and a side switch cue. 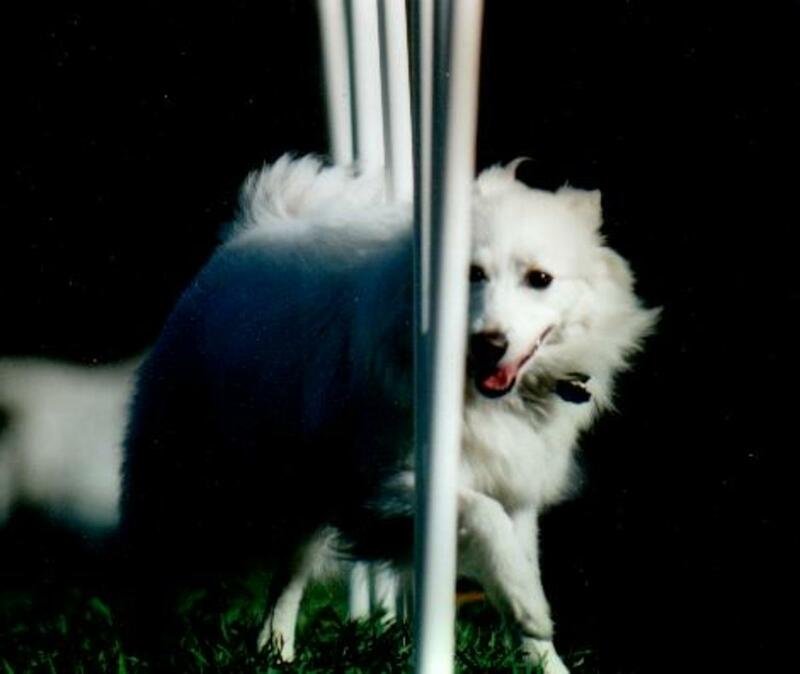 How Far "Out" Can Your Dog Go? If you were to ask your dog to do an "Out" directional today, how far out do you estimate your dog would go? This is article two in the "Distance Series." If you haven't read article one, I strongly recommend you do so before reading article two. 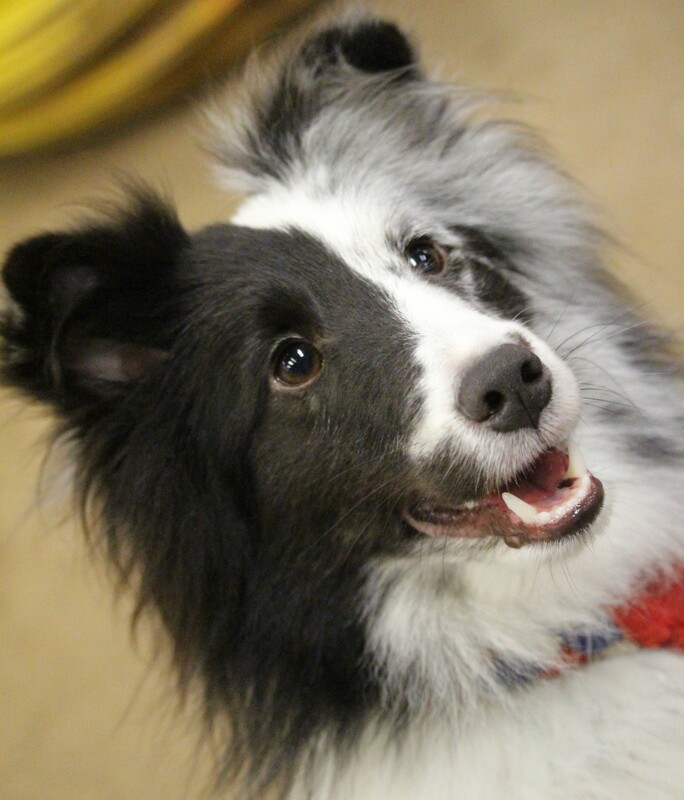 You can find the first article, "How to Train an Agility Dog to Run with a Physically Limited Handler" by clicking here. The third article in the series on training the straight, here and side switch directionals can be found here. I have also written an op/ed piece called, "The Truth About Distance Handling and Today's Agility Challenges," which examines whether it is feasible for those who are physically limited to do the Euro-style challenges found in today's agility. You can find that article by clicking here. The three "Distance Series" articles have been revised from a series Agilitymach wrote for "Clean Run" magazine in 2009. There will be one more article in the series. Stay tuned! How to Train the Straight, Here and Side Switch Directionals - Part Three in the "Distance Series"
Can The Disabled Handler be Competitive in Dog Agility? Is What You Are Feeding in the Agility Ring Hurting Your Team?